There is something unusual about this image. It is the vantage point. You see, I am not on the ground. I am flying! Flying! Well…maybe I am in a lift bucket. But, it feels like flying! This is the rear, east facade. It is highly visible as the house is on a corner. The previous owner primed the walls to the right, stripped the paint on the east wall, and painted the dormer. We are now at work replacing siding. The two diamond-paned windows light the main pantry. The two round windows (sooooo cool!) light the 4-story servant’s stair. Flying!!!!!!!! The asphalt shingles are soon to be replaced. The white line to the left is the built-in gutter, now relined by Groh & Sons, who are doing the gutter and roofing work as part of the Heritage Grant the Cross House received. The newly lined dormer gutter. All the gutters are now done, and for the first time in many many many decades the gutters are funneling water AWAY from the house rather then INTO it. Praise the Lord! I had thought that the main roof was covered in 1920s cementitious tiles, but this close-up view reveals a startling, shocking truth: These are NOT cementitious tiles, but rather are, no doubt, the scales of a giant dragon which long ago died on the roof of the Cross House. Or…perhaps the dragon is just sleeping? 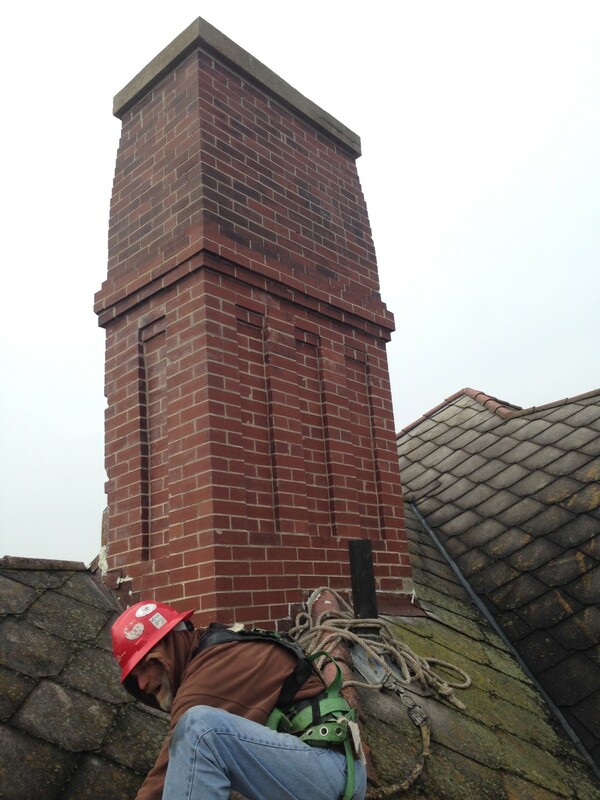 I love love love a good chimney. They tend not to be noticed from ground level, but they are POWERFUL and GORGEOUS up close. Steven, from Groh, a wisely treading gently on the roof, careful not to wake the possibly sleeping beast! 13 Responses to Flying over 1894! What did you mean by relining the gutters? Don’t you mean replacing them? If the gutters are old and neglected and rusted through, you have to pull up the metal and replace it in kind. If you mean they coated it or laid a rubber membrane on it, well, I would be surprised. What is going to replace the shingles? The gutters have been relined with an elastic coated membrane. The roofer (with an excellent reputation) recommend it. I read up on the product, and it gets excellent reviews. 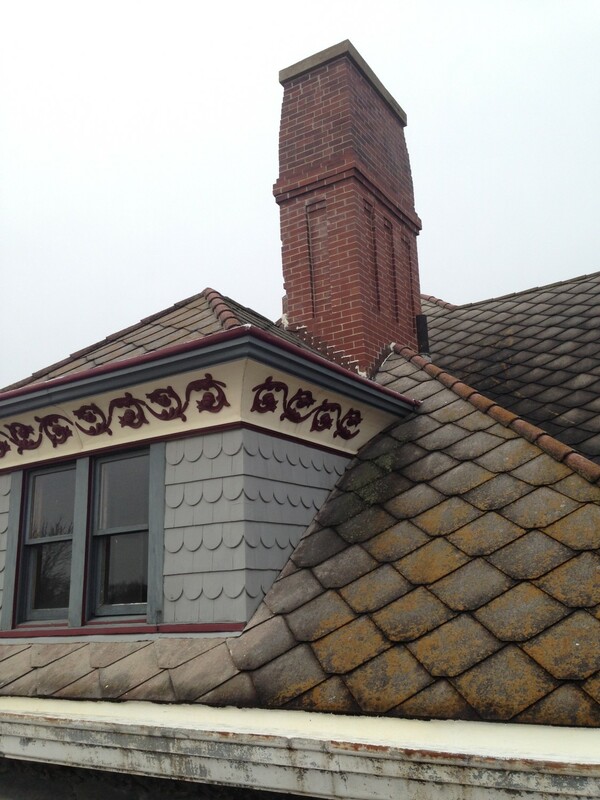 The 1920s cementitious roofing tiles (on the main roof) are going to remain in place. They will last till the end of time. The secondary roofs (towers and porches) have asphalt shingles. I am replacing these with asphalt, and did a series of posts last year on the subject. 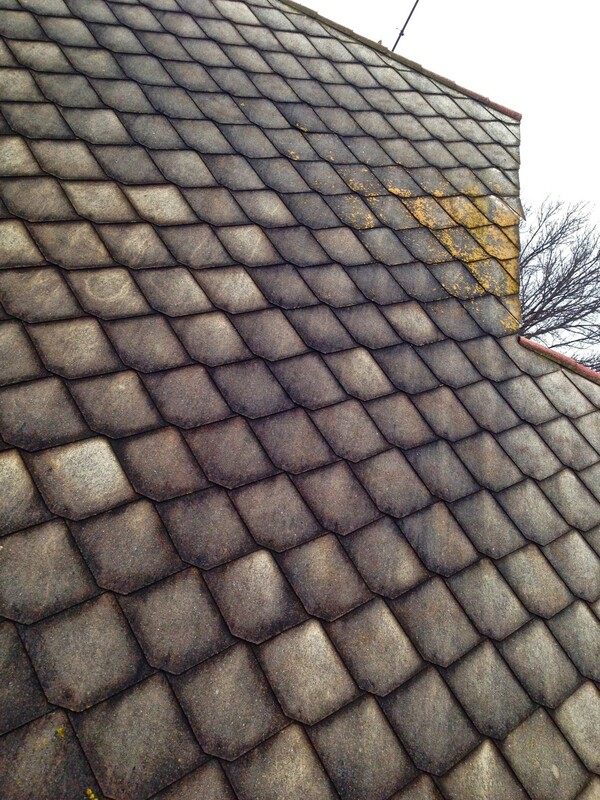 The original roofing was cedar shingles “dipped in hot oil”. I never planned to replace this roofing material as it is incredibly expensive, and will last about as long as the asphalt shingles. 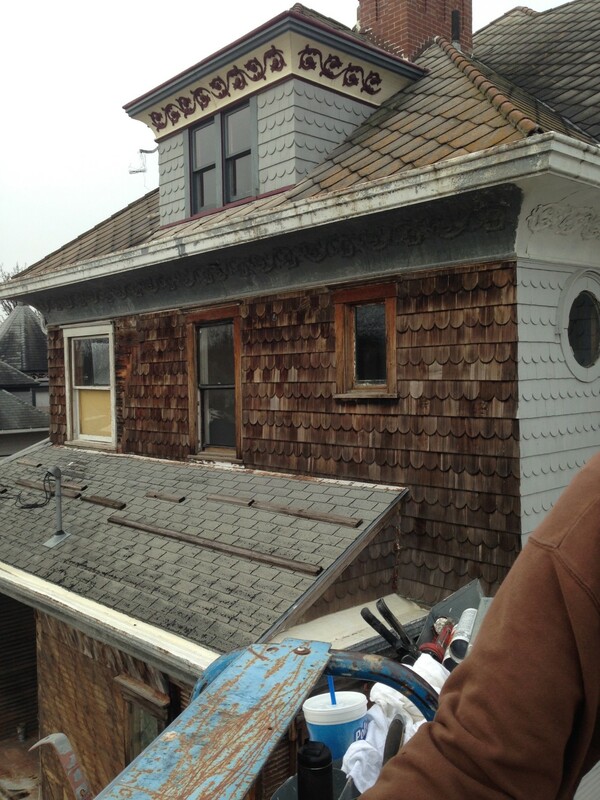 A friend of mine redid the roof on his historic house with cedar shingles…and deeply regretted it. I’m glad you feel this way about the cedar – we’ve made the same decision about rebuilding the porch (which had a cedar roof), but hearing your friend’s regret helps the angst. Oh my! What wonderful images! I am so excited to see the house from this vantage point(s). That shingle pic is terrific! It does look like scales. Did you reline your gutters with copper??????????? If so, geez, what did THAT cost? Not nearly as much as roofing with dragon scales!!!! 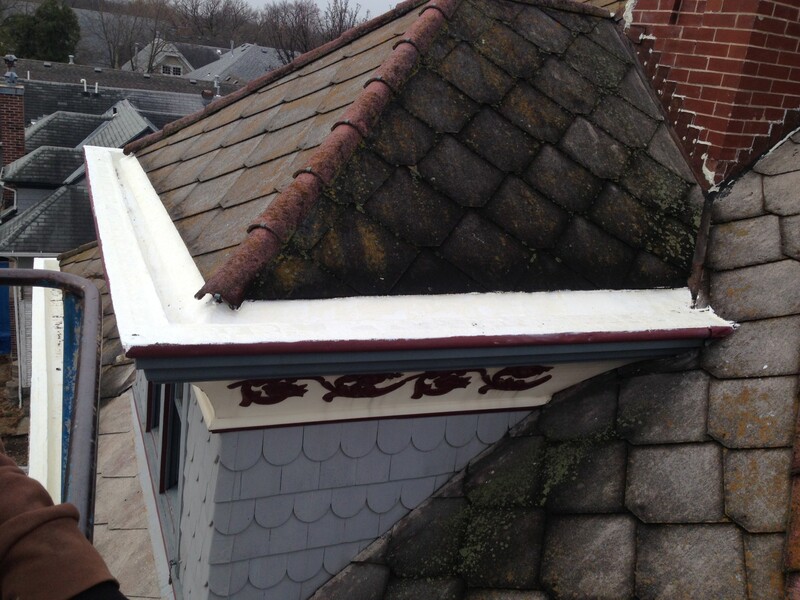 The box gutters were originally lined with copper that wrapped down and around the decorative molding. Our roofer recognized that this was integral part of restoring the slate roof and the additional expense over just lining with rubber membrane was only the time needed to bend the copper. Your gutters are quite different than mine. My HUGE curved cornices AND the built-in gutters AND the roof flashing are all, essentially, one piece, as everything is soldered together. To replace the gutters I would have had to, at HUGE cost, cut out the gutter parts, and solder in new gutters. This would involve FLAMING torches, and the risk of burning the house down killed this idea even if I could have afforded it. This is how Uppark House was almost totally destroyed. Even my copper/slate guy is now relining with rubber. I think it’s the right choice – copper is only as good as the solder joints (I found out the hard way), the rubber is nearly seamless and seems to be indestructible. Ross about 6yrs. ago before I had my roof reslated, I researched the cost of yankee gutters. I know yankee gutters are different than what is on your house. Basically a yankee gutter is built into the eaves with a 1″ board that is perp. to the roof plane. Then sheet metal is formed and installed with cleats over the edge of the roof and under the slates. It is usually ‘v’ shaped. The cheapest price I heard was $50/lf and I think $75/lf and higher was more typical. This is for 16oz. copper. So it is quite pricey to be authentic. I dearly wanted to go that route, but I bought half-round gutters from Classic Gutters in Kalamazoo. 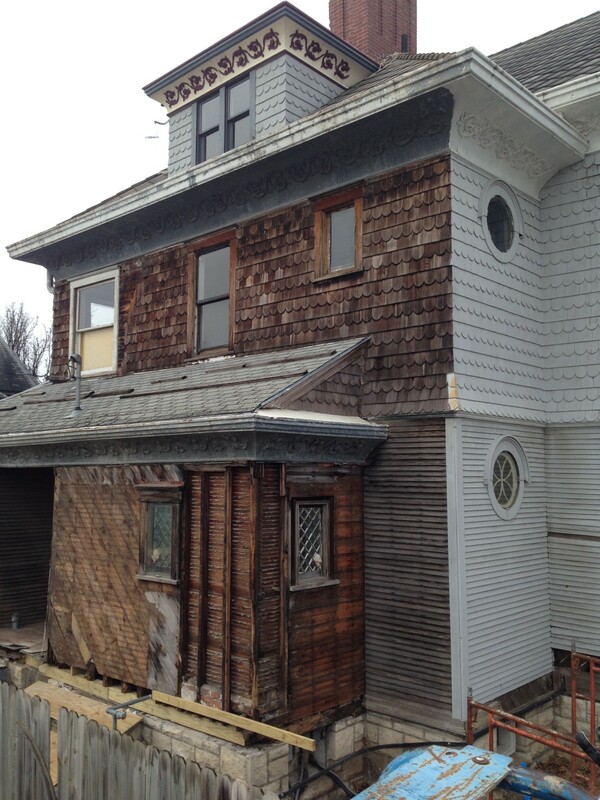 Sometimes you have to draw the line with restoring a house authentically and what won’t bankrupt you. Also, I am not in the roofing business, but from everything I have heard good roofers won’t use torches. They use heavy soldering irons. Some of them are electric and some use propane to heat the tips. There are videos on YouTube illustrating their use. Yes, we have very very very different types of gutters. As I wrote above, replacing my gutters would have been a nightmare because they are all of one piece with the roof flashing and huge cornices. I am thrilled with the solution. Also, highly qualified roofers were doing the work at Uppark Hosue (mentioned above). They were doing solder work…and burned the house down. Because of this, and other such horror stories, I am PHOBIC about any flames, so-called “hot” work, heat guns, and even high-speed drills. Several times my house almost caught fire and like you I am scared to death of a fire burning down my house with me in it. I would in a heartbeat have a residential fire sprinkler system IF I had the money. My friends think they’re ugly and don’t belong in homes but I think the safety is worth it. If you could get a grant to sprinkler your historic house, would you?